At Pink Oatmeal we are all about making all types of yoga and movement fun for kids. One way of doing that is with yoga. To make yoga for kids even more fun we’ve come up with all sorts of different themes. The themes turn traditional kids yoga poses into fun poses to go with theme. Check out all of the different ideas to make yoga even more fun for your kids or the kids you work with! A couple of tips before starting. When doing yoga with kids don’t get stressed out about perfection. Don’t worry if you aren’t perfect when you are showing the kids how to do the yoga poses. Nobody is perfect. Have fun and enjoy! See more tips on yoga for preschoolers too. Get any kind of yoga cards for kids you can imagine in the Pink Oatmeal shop! 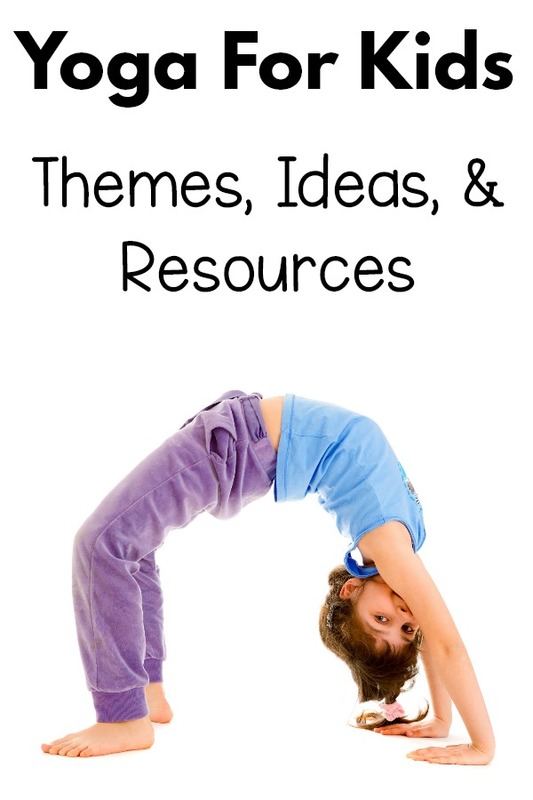 The following themed yoga for kids ideas make it easy to add these right into lessons. Themes also provide a great opportunity for kids to choose what type of yoga interests them! Pet Yoga – Kids can pose like their favorite pets! Circus Yoga – This super silly yoga is sure to make your kids laugh out loud. Arctic Yoga – Learning about the cold, arctic yoga is a must! Plus, get the free yoga story! Woodland Yoga – Woodland yoga is perfect for a forest or woods theme. These ideas also go great with a camping theme. Space Yoga – Your kids will LOVE posing like an astronaut or rocket! Farm Yoga – The perfect way to move like farm animals is with a farm theme! Zoo Yoga – Who doesn’t love moving like a lion or monkey? Ocean Yoga – An ocean theme, beach theme or summer theme all are perfect when it comes to ocean yoga! Sports Yoga – Know any sports lovers? They will go crazy over sports themed yoga! Dinosaur Yoga – Don’t let your dinosaur lovers miss out on their chance to pose like their favorite dinosaurs. Cowboy Yoga -Pose like a cowboy, cactus, or horse. Your kids will love this themed yoga! Pirate Yoga – Walk the plank or set sail in this pirate themed movement activity. Desert Yoga – Are you learning about the desert or live in the desert? Try this theme for a much needed option for movement. Jungle Yoga – Pose and move like the jungle animals in this fun theme! Garden Yoga – Are you learning about gardening, farming or spring? Garden themed yoga is the perfect addition. Insect Yoga – Insects, bugs, and creepy crawlers are made fun and exciting for kids when they get to move like them! Nursery Rhyme Yoga -Nothing is better with a nursery rhyme unit then the opportunity to move like your favorite nursery rhymes. Rainforest Yoga – A great addition to your habitats or rainforest unit. Superhero Yoga – Let your superheroes move like superheros when they do superhero yoga poses! Transportation Yoga – Cars, trains, and planes are just the beginning of this fun theme! Weather Yoga – Adding movement to the weather is perfect for morning meeting or your weather unit. Your kids will love the tornado pose! Wetland Yoga – Another perfect addition to a habitat, wetland or pond unit. Camping Yoga – Your kids are going to love posing like a tent, moon, or stars with this fun theme. Adding yoga and movement to go with the seasons is another great option for kids yoga. This gives kids the opportunity to move like a leaf, snowflake, flower, or sun! Winter Yoga – Even when it’s cold this winter theme makes yoga so much fun! Spring Yoga – Flowers, kites, and rainbows make this movement activity a must. Summer Yoga – Pose like the sun or swimming. Summer yoga is a great addition to the end of the school year or summer theme. Fall Yoga – Move like a falling leaf or scarecrow with this fun fall themed activity! Incorporating a holiday theme can get kids really excited about moving and yoga poses! Most kids are already so excited about the holiday that they will be thrilled to try these different poses and movements! Christmas Yoga – Try ho-ho-ho breathing or posing like an elf with the Christmas theme! Thanksgiving Yoga – Pumpkin pie and turkey poses are a must with a Thanksgiving theme! Halloween Yoga – A fun activity for a Halloween party that incorporates movement that is so important for kids! Patriotic Yoga – You can get a set of patriotic yoga cards for FREE in the freebie library from Pink Oatmeal. Earth Day Yoga – Pose like the earth and celebrate Earth Day with this fun yoga activity! Easter Yoga -Another awesome set of FREE Easter themed yoga cards are available in the Pink Oatmeal freebie library. St. Patrick’s Day Yoga – Shamrocks, clovers, and leprechauns are all a part of this fun theme. Valentine’s Day Yoga – A great addition to Valentine’s Day and any Valentine’s Day celebration! More interested in general animal yoga for kids? Check out this list of our favorite animal yoga poses for kid! Adding in movement and yoga for kids right into the learning process can be made easy with a little creativity. Kids won’t even realize how much they are learning as they will be having so much fun moving. A win for them and a win for the adults! Alphabet Yoga – The best way to learn about the alphabet is while in motion. Alphabet yoga can make this happen. The kids won’t even realize how much they are learning when they are having so much fun moving. Shapes Yoga – Shapes can be made more fun and memorable when you can turn your body into the shape. Shapes yoga makes this possible! Then there is incorporating yoga into the classroom. Be sure to check out all of the tips to incorporate different yoga poses and ideas right into your learning environment.